A few pics from this weekends 9th Age Tournament. 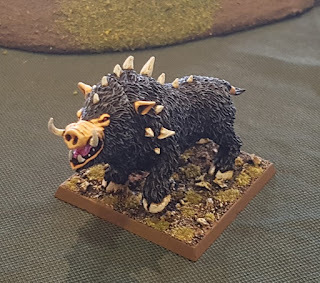 I haven't played 9th Age for a while and decided to give it a whirl, even painting up two new Gortachs to add to my Beastmen. 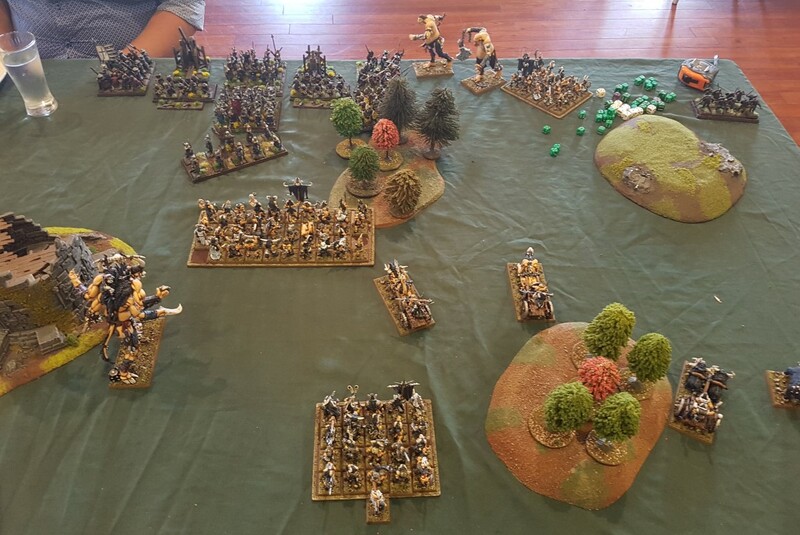 First game vs Alex's Dwarves. 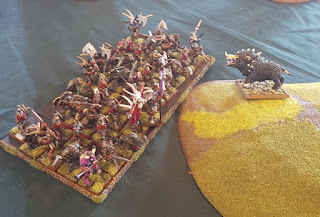 A major win for my Beastmen, with my two Gortachs (the big bull things) repeatedly stomping the poor stunties and doing a lot of damage. Dwarven great weapons eventually claimed one of them though. 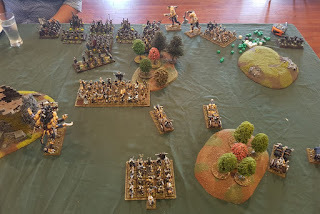 Second game against Jesse's Bretonnians. 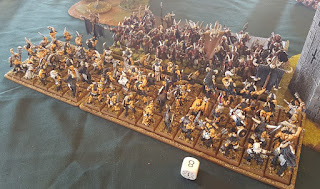 I was outplayed here, getting myself into a real traffic jam, but after his knights killed my first Gortach they were in turn charged and run down by a big Wildhorn herd. And even greater luck occurred, with my Razortusk managing to charge and run down a unit of Pegasus Knights. Here he is looking happy with himself. With most of the Knights out of the way there was just the Peasants to deal with. This the Beastmen did, though not without some hard fights in places, including one of the Giants being killed. 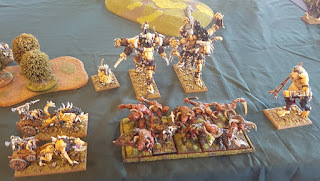 Last game was my Beastmen against Mike's new Beastmen. 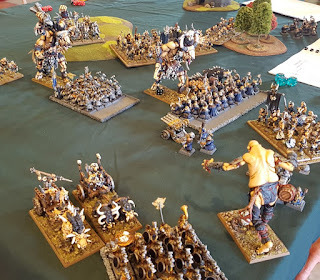 A big moment of the game was when his Minotaurs chased my Ungors off the board, so I set up a welcome party for his return as below. 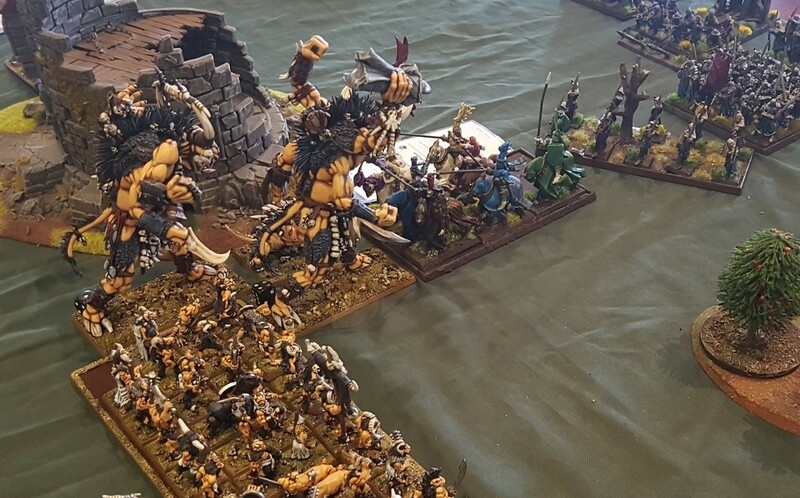 It was a bloody battle though, with Mike's Minotaurs managing to kill a Razortusk Chariot, a Razortusk, and seriously injuring both Gortachs and the Giant before they went down. My other Razortusk was again a star player, here running around in front of Mike's Longhorns slowing them down. 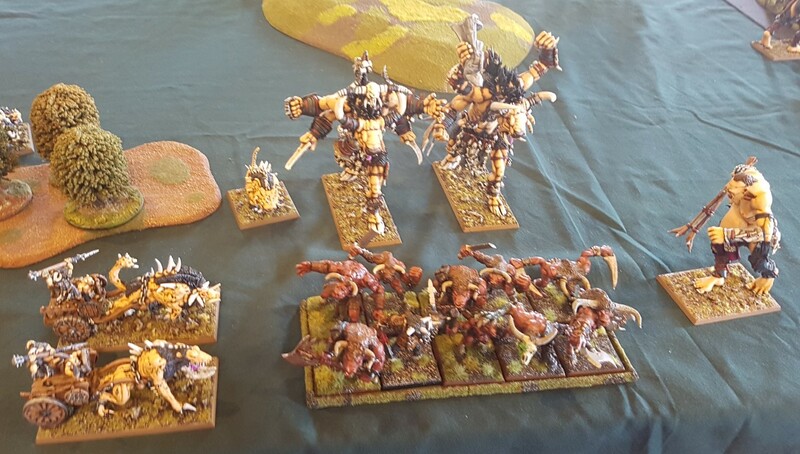 Big Wildhorn battle on the left flank. 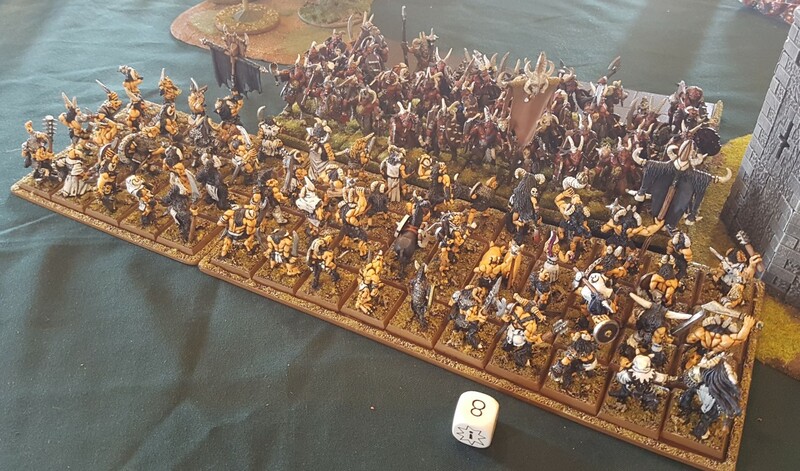 My Wildhorn units roll and get primal fury, Mike's don't and his unit is run down. A fun day out, and with three big victories my Beastmen carried the day. Sadly some players who are more regulars than myself were away with beer festival, wedding anniversary etc. Tournament will apparently be a bit earlier in the year next time so as to clash less with the local beerfest and other events.